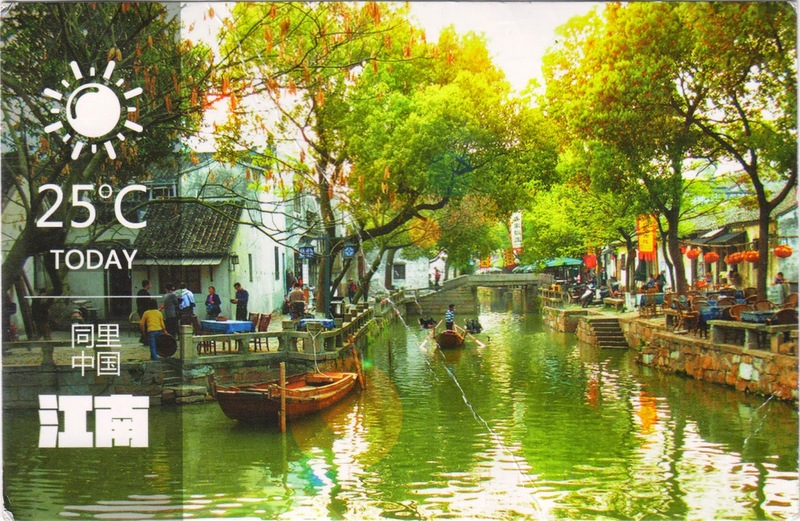 Postcard CN-1076001 from China shows Tongli (同里), a historical town in Wujiang county, Jiangsu Province, China. It has been given the nickname "Venice of the East" for a system of canals. The town, on the outskirts of Suzhou, retains many of the features of an ancient Wu region town. One of most notable attractions in Tongli is the Retreat and Reflection Garden (退思园). It is a private garden built in 1885-1887 by designer Yuan Long. The concept of design was adopted from a famous quote "Step forward to do your job loyally; step back to think about how to make up your mistakes (進思盡忠，退思補過)" in Zuo Zhuan (左傳) or sometimes translated as the Chronicle of Zuo that is among the earliest Chinese works of narrative history, covering the period from 722 B.C. to 468 B.C. Through an extension in 2000, the Retreat and Reflection Garden, along with the Canglang Pavilion, the Lion Forest Garden, the Garden of Cultivation, the Couple's Garden Retreat, was included in the property of the Classical Gardens of Suzhou, a UNESCO World Heritage Site that was originally recognized in 1997.